Companies that use SAP® need to have a method to access all valuable information that is recorded in order to make the best business decisions and establish a sustainable competitive advantage. 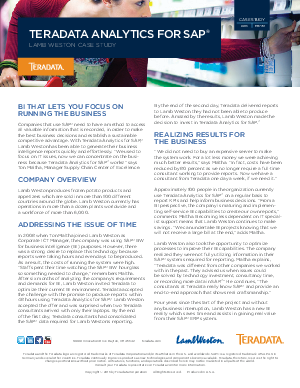 With Teradata Analytics for SAP®, Lamb Weston, a global frozen potato product producer, has been able to generate their business intelligence reports quickly and effortlessly. BI that lets you focus on running the business…Download now!